Rabieh is Lebanon’s most coveted residential community. The area covers nearly one million square meters of gentle slopes 400 meters above sea level at a distance of 10 Km north-east of the capital Beirut. 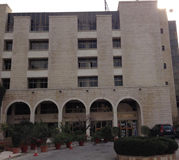 In keeping up with requirements of change, Rabieh inaugurated its complete Center which incorporates a warm and well furnished guest house, a professionally managed restaurant, a well spaced ballroom, and an athletic club facilities. All this together with an adequate underground parking that is open for the convenience and service of the people of Rabieh Hotel and their guests.